Missing is a story about a literary club where one of the members disappears. These students claim to be the smartest in school and attempt to show it off by having lengthy discussions about society, religion, love, etc… I have never, in all my manga-reading years, seen a story with more words in it. The bubbles are practically bursting with conversation. At one point the font is so small (to get all the words in the bubble) that it becomes hard to read. This is a good thing for those of you looking to get more intellectual stimulation from a comic. For me, it was kinda exciting at first, then got tiresome, and just before it annoyed me, they got into the meat of the spooky tale. 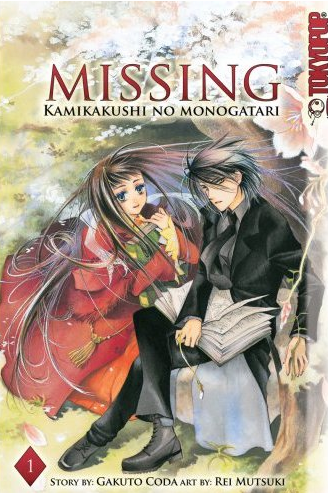 The reason for the overly wordy manga is because it's an adaptation from the novel Missing by Gakuto Coda . The character all us Gloom Cookies will like is named Kyoichi. He is tall, dark, handsome, and wears a long black cloak like a priest. He’s the type that sits in the corner reading while the others are going on about whatever nonsense they deem important. Sort of a modern-day Mr. Darcy, he scares people by merely pointing at them. A couple of the classmates worship him and call him “Your Majesty” or “Prince of Darkness”. One day, a raven-haired beauty shows up outside and he is drawn to her. Soon he goes missing and the club members meet to speculate on where he has gone. My first thought was, if I was part of this club and they had to discuss every facet of my disappearance, I would be dead before they figured it out! They discuss Kyoichi’s fascination with death, the occult, ghosts, and the Kamikakushi which are “Stealers of Souls”. A poem starts this manga, which I am not a fan of, and there is not much action. However, it does have a spooky element because of the kids investigating what could be the cause of Kyoichi’s disappearance. They pull out reference books and start referring to especially spooky passages. To read this review, you may think I didn’t like it, but In a strange sort of way, I did. This manga is like watching Dead Poet’s Society. It’s deep, makes you think, and might even cause you to shiver, but when you’re craving something fun, leave it on the shelf! Extras: 4 pages from the author and an excerpt from the novel. Interested in checking this out? Buy it now on Amazon.com. Older PostWorst: Spider-Man 4 Are We To Expect 4 Villains?